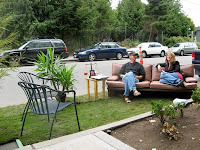 Park(ing)Day took place on Friday, September 19, and was a "one-day, global event centered in San Francisco where artists, activists, and citizens collaborate to temporarily transform metered parking spots into “PARK(ing)” spaces: temporary public parks." The Trust for Public Land hired CORE GIS to create a map of the park locations in Seattle, to hand out to curious passers-by and help people find the various parks. This photo of one of the parks was taken by Jeanine Anderson.